If you’re an innovative educator who knows your students sometimes find traditional teaching methods like textbooks and tests to be a bore, consider infographics. These great tools are making their way into more and more classrooms. Take for example the following infographic. It shows that while there are some exceptions, overall, countries that have high levels of English speaking citizens tend to have a better Gross Domestic Product (GDP). Should all countries invest in English language learning? 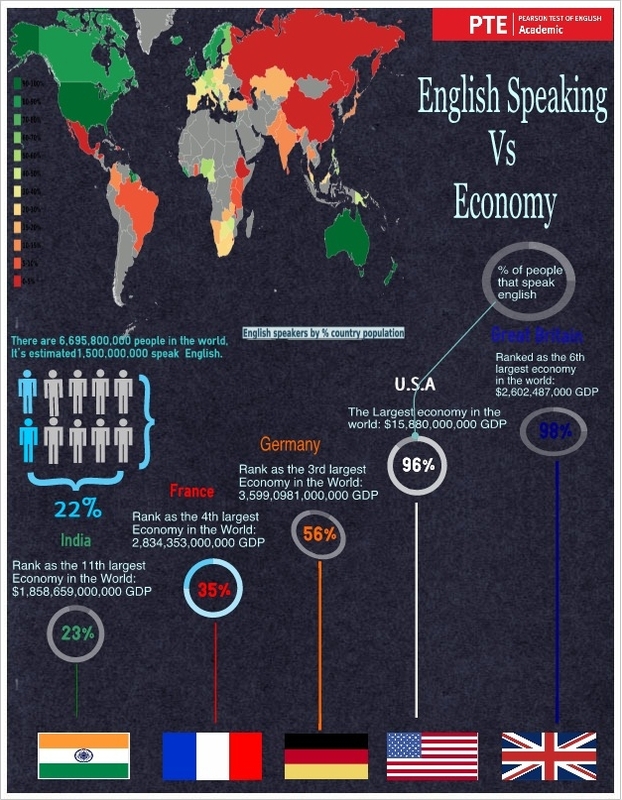 What is the correlation between GDP and other languages? If/when a country prioritizes learning the English language does it lead to increased wealth and power? Rather than giving students assignments with answers residing in the teachers’ edition, innovative educators are using infographics like this which require students to use critical thinking skills and don’t necessarily have just one right answer. Some educators are not only using these as tools to help stimulate critical thinking and discussion, they are also encouraging learners to create their own infographics using tools like Thinglink and Visual.ly. I have found that with an emphasis on data and computational thinking, my teachers/students are much more able to "get" the concept of integrating technology in learner-centered ways. It's a great way to extend the type of inquiry found in STEM to other subjects. Watch 140edu live today and come tomorrow! What will you do the first five days of school?